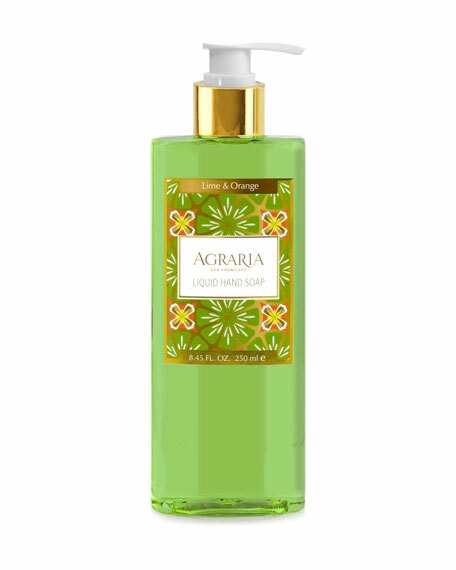 Wash your hands with luxuriously scented Agraria soap. A silky and refreshing blend of wheat proteins, panthenol and botanical extracts of sage, rosemary, golden seal, geranium, horsetail and ginkgo biloba. Uniquely formulated to gently clean and moisturize your hands. The Fragrance: Lime & Orange Blossoms is an exhilarating fragrance filled with Lime & Orange Blossoms, and surrounded by the beauty of Night-Blooming Sampaguita, Honeysuckle, and Jasmine. Amber Woods, Smoky Patchouli and Oak Moss add depth to a velvety smooth background.